Below you can find the materials and resources I refer to in the book and in different episodes of my podcasts. 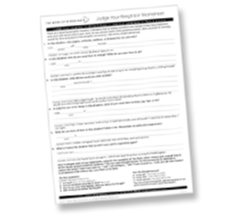 The Judge-Your-Neighbor Worksheet is one of the most basic elements in doing The Work. 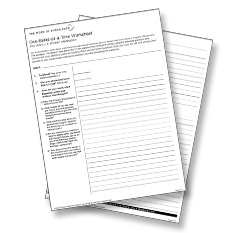 Fill out this worksheet to capture your stressful and limiting thoughts about others and question them using The Work. This worksheet is copyright by Byron Katie International Inc. The One-Belief-At-A-Time Worksheet allows you to take a single belief through the entire process of The Work step-by-step. This worksheet is often used in combination with the Judge-Your-Neighbor Worksheet if you are working on your own and prefer to do The Work as a written meditation. The Do-The-Work App combines the Judge-Your-Neighbor Worksheet and the One-Belief-At-A-Time Worksheet into a single flow and allows you to do The Work on your smartphone or tablet. Capture your beliefs on the go and work them when you find the time. These apps are copyright by Byron Katie International Inc.